Featuring the original songs of Naomi Ferguson Lisa Tui & Nikki Berry - musicians supporting activists - with special guests and a 'pop up choir'. 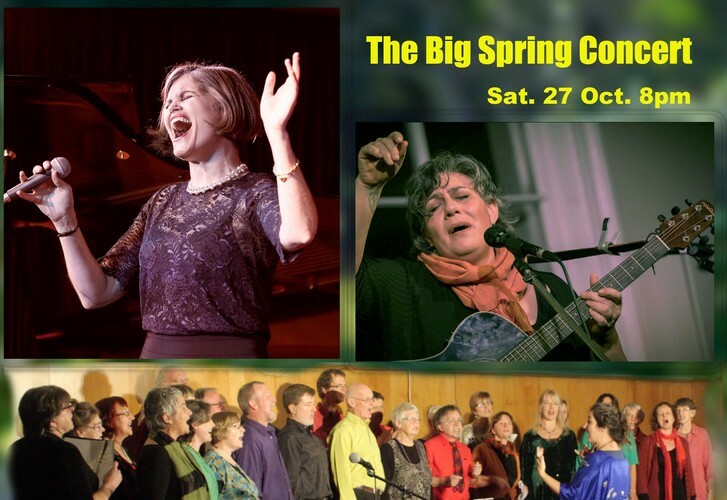 This concert features the original songs of Naomi Ferguson, Lisa Tui and Nikki Berry along with a 'Pop up Choir' and special guests on piano, saxophone and cello, Alex van den Broek, Gary Easterbrook, Matt Davis and Nicole Reddington. Anyone can join the pop up choir. The rehearsal is on Saturday, the 6th of October. All proceeds go to keeping the Christchurch volunteer office of the Green Party open. Naomi Ferguson is a singer, actor, pianist and songwriter whose professional career spans over twenty years. Naomi's recent theatre credits include Priscilla, Queen of the Desert (Diva 3, Shirley) for Showbiz Christchurch, and the role of Blanche in A Streetcar Named Desire for Canterbury Repertory. Naomi has also toured New Zealand with her one woman show Songs My Mother Taught Me. A regular performer at festivals nationwide, Naomi has been an audience favourite at the International Jazz & Blues Festival with shows like The Bacharach Years, From the Chapel to the Club, Women in Jazz, At Last: The Songs of Etta James, and The Billie Holiday Years. She has also curated and performed shows in the Christchurch Arts Festival including recent highlights Salon Kitty and Totally Weill. Naomi has three studio albums to her name. An avid songwriter, her songs have been showcased in film and theatrical productions. She also writes and records electronic music as part of duo Speak Softly, whose music can be found on Bandcamp. Lisa Tui - SingerSongwriter - is known for her rich and beautiful voice, her songs personal, connecting and clever. With a background including singing gospel, funk, music theatre, jazz, pop and country her music reflects a little of all those influences with a definitive groove and lilt that is her unique and captivating. Featuring as a performer in festival concerts and local hot spots Lisa has recorded two EP's and is embarking on her first Album. She is also a teacher, choir leader and facilitator, Lisa excels in bringing people together to sing, learn and be involved in a transformative musical experience. Nikki's musical roots are as a singer/songwriter and bass player, although she is currently best known for her work in community music. She writes in a wide range of styles from acoustic to funk. Her short set will be with Nicole Reddington on cello and Gary Easterbrook on piano/guitar.